Since February, 2014, JICE has started its operations in Africa as an implementing body of Master's Degree and Internship Program of the African Business Education Initiative for Youth (ABE Initiative Program) entrusted by Japan International Cooperation Agency (JICA). This program is the first program in which JICE set up local offices for full-fledged operations in Africa region. In order not only to discuss ABE initiative Program but also to deepen the relationships with African government agencies and universities, Ms. Sachiko Yamano, President, Mr. Takashi Akao, Deputy Director of International Students Division and Ms. Eriko Maegawa, Senior Program Officer of International Students Division visited Kenya and Tanzania from 14th to 21st of February, 2015. In Kenya, JICE delegate made a courtesy call on the Embassy of Japan in Kenya, JICA Kenya office (Mr. Hideo Eguchi, Chief Representative) and Toyota Kenya Academy (Mr. Sachio Yotsukura, Managing Director of Toyota Kenya Limited.) and then visited Jomo Kenyatta University of Agriculture and Technology (JKUAT) on 16th Feb., and the Ministry of Foreign Affairs & International Trade on 17th Feb. JICE delegate elaborated roles of JICA and JICE in ABE initiative under human resource development, while sharing ideas on the progresses of ABE initiative Program with Kenyan counterparts. 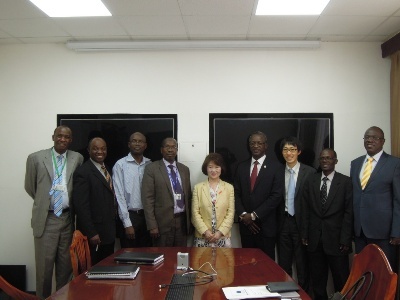 JICE delegate paid a visit to Professor Mabel Imbuga Vice-chancellor of JKUAT and other board members. In that meeting Ms.Yamano said that JICE has been supporting human resource development programs cooperating with JICA and education bodies such as Japanese universities. Based on achievement and trust JICE has gained, JICE is now fully committed to play a new role of implementing ABE initiative. Professor Imbuga was delighted that Ms. Yamano selected JKUAT as her real first stop in Kenya for her first historic visit even in Africa. She also expressed her intention to deepen a relationship with JKUAT and JICE through cooperation and joint project. The visit to Ministry of Foreign Affairs & International Trade was kindly arranged by His Excellency Mr. Solomon Karanja Maina, Kenyan Ambassador to Japan when Ms. Yamano and her colleagues had made a courtesy call before her visit to Kenya, and the visit was realized on 17th of February. At the Ministry, her team had a reunion with His Excellency Mr. Ben. H.O. Ogutu, political & diplomatic secretary and former Ambassador to Japan. JICE delegate also met Mr. Christopher M.Chika, director of Asia & Australia and other high officials from related departments and ministries. Both of side exchanged opinions regarding human resource development in Kenya as well as ABE initiative Program. 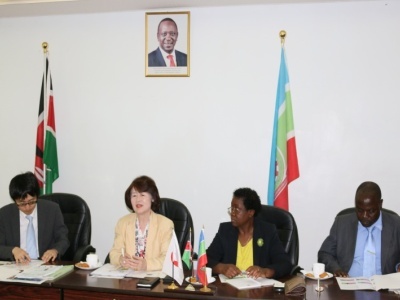 Some of Kenyan officials expressed high expectations to this Program, referring that the Program provides prospective young Kenyans studying at Japanese universities with opportunities to study in Master courses but also to be exposed to Japanese work culture, work ethics and diligence through internship at Japanese private companies. 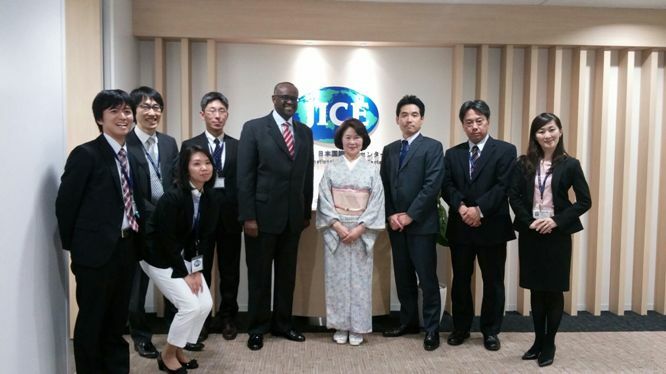 His Excellency Mr. Maina, Ambassador of Republic of Kenya visited JICE on March 5ht, 2015. H.E. Mr. Maina has a strong interest in human resource development of Kenyan youth and is always thinking much of Kenyan students studying under ABE initiative. H.E. Mr. Mania’s visit to JICE shows his generous aspect that he’d really like to assists them. H.E. Mr. Maina told that he is thankful for JICE’s support to Kenyan students under ABE initiative scholarship. ※His Excellency Mr. Uhuru Muigai Kenyatta, President of republic of Kenya is to visit Japan to attend the 3rd conference on Disaster Risk Reduction in Sendai, which is planned to open on 14th March, 2015. On this occasion, JICE welcomes His Excellency’s visit to Japan hoping that JICE can contribute to develop further relationship between Kenya and Japan through cooperation of human resource development.